A team of astronomers, including four from Texas A&M University, has discovered that the universe is expanding 5 to 9 percent faster than expected, based on observations with the Hubble Space Telescope. The surprising result, to be detailed in an upcoming issue of The Astrophysical Journal, represents the most recent advance in a thus-far 11-year study by the SH0ES (Supernova Ho for the Equation of State) Team, founded in 2005 by Nobel Laureate Adam Riess of the Space Telescope Science Institute and The Johns Hopkins University and Texas A&M’s Lucas Macri, an associate professor in the Department of Physics and Astronomy and member of the George P. and Cynthia Woods Mitchell Institute for Fundamental Physics and Astronomy since 2008. 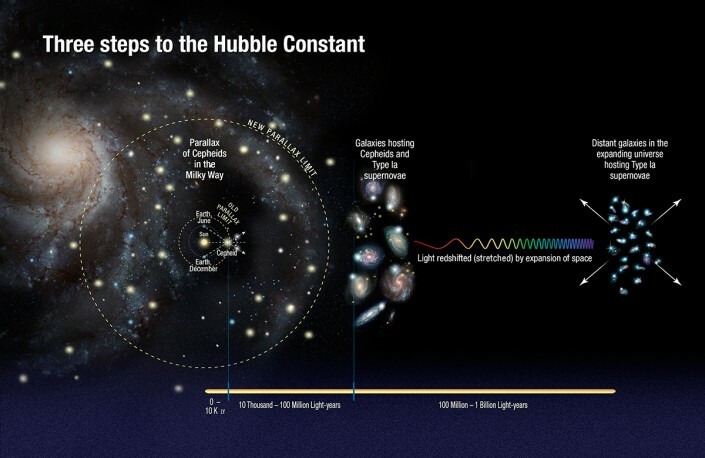 The project aims to improve the measurement of the current expansion rate of the universe – known as the Hubble constant or Ho after Edwin Hubble, who first measured the expansion of the universe nearly a century ago – to a level of accuracy and precision that allows a better understanding of its composition and ultimate fate. In this latest round of results, the team reduced the uncertainty to an unprecedented level of only 2.4 percent by developing innovative techniques that improved the precision of distance measurements to faraway galaxies. “This surprising finding may be an important clue to understanding those mysterious parts of the universe that make up 95 percent of everything and don’t emit light, such as dark energy, dark matter and dark radiation,” Riess said. The team looked for galaxies containing both Cepheid stars and white-dwarf supernovae. Cepheid stars pulsate at rates that correspond to their true brightness, which can be compared with their apparent brightness as seen from Earth to accurately determine their distance. White-dwarf supernovae, another commonly used cosmic yardstick, are exploding stars that flare with the same brightness and are brilliant enough to be seen from relatively longer distances. By measuring about 2,400 Cepheid stars in 19 galaxies and comparing the observed brightness of both types of stars, the team accurately measured their true brightness and calculated distances to roughly 300 supernovae in far-flung galaxies. The team compared those distances with the expansion of space as measured by the stretching of light from receding galaxies to calculate an improved Hubble constant value of 73.2 kilometers per second per megaparsec. (A megaparsec equals 3.26 million light-years.) The new value means the distance between cosmic objects will double in another 9.8 billion years. Three Texas A&M Astronomy group members in addition to Macri played a part in the team’s refining progress. Postdoctoral fellow Samantha Hoffmann led the analysis of visible-light observations that resulted in the discovery and homogeneous characterization of the Cepheids. Graduate student Wenlong Yuan contributed to those efforts, studying the images of one of those galaxies and also analyzing ground-based infrared images of Cepheids in the Milky Way. Postdoctoral fellow Peter Brown also provided observations of some of the supernovae from NASA’s Swift satellite. Riess notes that this refined calibration presents a puzzle, given that it does not quite match the expansion rate predicted for the universe from its trajectory seen shortly after the Big Bang. Measurements of the afterglow from the Big Bang by NASA’s Wilkinson Microwave Anisotropy Probe (WMAP) and the European Space Agency’s Planck satellite mission yield predictions which are 5 and 9 percent smaller, respectively.